Take this medication 2 to 3 hours before or after taking certain antibiotics (e.g., tetracyclines, quinolones such as ciprofloxacin). The minerals in this product may interfere with the antibiotic, preventing it from being absorbed. Tell your doctor if any of these highly unlikely but seriousmental/mood changes, unusual weakness. List Daily Multiple Tablet side effects by likelihood and severity. This product should not be used if you have certain medical conditions. Before using this product, consult your doctor or pharmacist if you have: low blood count (e.g., pernicious anemia, megaloblastic anemia, vitamin B-12 deficiency), high calcium levels, kidney disease, liver disease. 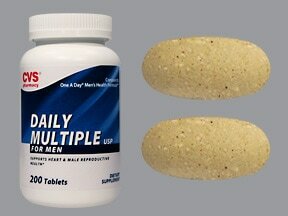 Have you ever purchased Daily Multiple Tablet?